Prep Day: Clean and break broccoli into flowerets. Boil in lightly salted water until tender-crisp; drain. Cut flowerets, using some of the tender stalks. In a large skillet, heat olive oil. Add garlic and breadcrumbs; cook 3 minutes. Add Parmesan cheese and broccoli, tossing and cooking 2 minutes longer. Butter 2 quart casserole dish. 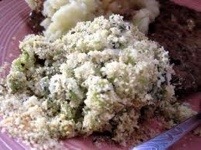 Add broccoli mixture then top with additional crumbs and cheese. Serve Day: Defrost. Bake 350 degrees until golden, about 20-30 minutes.